A textile manufacturer was faced with a dramatic increase in demand for one of their most popular products which required spinning a second line of fibre. The existing equipment used to produce the pigment and polymer paste was not capable of supporting the two line rate, so the company set up a product development team to investigate methods of increasing capacity without compromising quality. Vibromilling is a slow, energy intensive process, with high maintenance costs. The throughput from the existing process was too low to meet the production increase. To supplement the existing process, a small bead mill was used on a trial basis. During the testing programme, the bead mill was installed at various stages - before vibromilling and after - but the product development team rapidly came to the conclusion that a very large and expensive bead mill would be needed to make any significant difference. 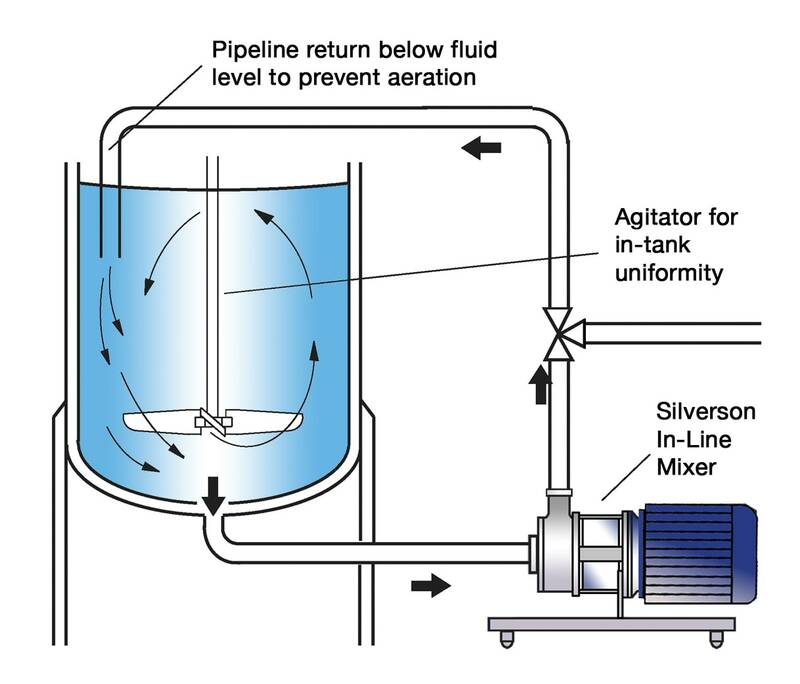 A Silverson In-Line mixer was provided for on-site trials. Because of the extremely high degree of mechanical energy required to produce the paste, a Multistage In-Line mixer was used. The workhead comprises two concentric sets of blades and teeth running against two separate stators. This produces intense high shear, resulting in substantially faster mixing times. During the testing programme a number of options were examined, including installation of the In-Line before and after milling and in a separate recirculation system. For a two week period the In-Line mixer was used on its own, eliminating the vibromills altogether, with acceptable results. When used in conjunction with the vibromills, the In-Line formed a fine premix which could be passed far more rapidly through the milling system - effectively doubling output and enabling the second production line to be maintained. Subsequently a Multistage unit was purchased and installed in the production plant. Easily fitted to existing process. Bypassing the intense high shear action of the rotor/stator assembly is impossible. The In-Line mixer's effort is not expended moving large volumes of liquid, but concentrated on the small volume of material inside the workhead at any given moment; a more energy efficient process.